"Was Barack Obama a Muslim?" FrontPageMag.com, December 24, 2007. Raises questions about Obama's having been born and raised a Muslim and considers the implications of his hiding this fact. "Barack Obama through Muslim Eyes," FrontPageMag.com, August 25, 2008. Reviews confused Muslim reactions to Obama's religion. "New Information About Barack Obama's Muslim Childhood." DanielPipes.org, August 28, 2008. Ongoing collection of new information about Obama's childhood religion. The only place at DanielPipes.org to find post-2012 new information on this topic. "Obama Would Fail Security Clearance," The Philadelphia Bulletin, October 21, 2008. Deals not with Obama's childhood religion but with his many ties to extremist Islam, and to the Council on American-Islamic Relations and to the Nation of Islam in particular. "Obama's Mansion, Saddam's Money," The Philadelphia Bulletin, October 29, 2008. Traces the "complicated connection" from the Democratic Party presidential candidate to the executed Iraqi tyrant via two corrupt Middle East businessmen living in the West, Nadhmi Auchi and Antoin S. "Tony" Rezko. "Muslims Respond to a President Obama." DanielPipes.org, November 7, 2008. 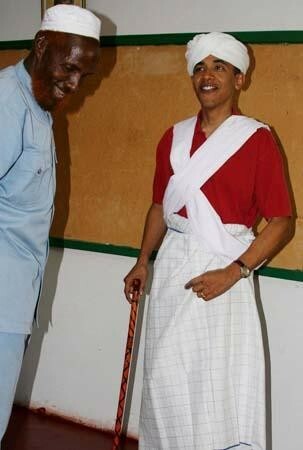 With Obama elected president, an on-going, updated weblog entry on how Muslims see Obama's religion. "Obama Wins, Muslims Divided." Philadelphia Bulletin, November 12, 2008. A survey of the surprisingly mixed reaction among Muslims around the world to Obama becoming the next U.S. president. "Barack Obama and Islam: An Ongoing Saga." DanielPipes.org, January 19, 2009. The flip side: follows Obama's statements about Islam through his presidency. "Obama, 'Respect' and Muslims." DanielPipes.org, January 26, 2009. Follows the mind-numbing times Obama talks about respecting Muslims. "Islam in Obama's Cairo Speech." DanielPipes.org, June 4, 2009. Looks in some detail at the capstone of Obama's efforts vis-à-vis the Muslim world. "Obama Makes Little Headway among Arabic-speaking Muslims." National Review Online, May 29, 2010. Notes that after an initial euphoria, Obama's poll ratings in the Middle East resemble those of George W. Bush. "Islam, Israel and Insurgents." Q&A - Adventures in democracy, Australian Broadcast Corporation. August 22, 2011. Note the section "Barack Obama a Muslim?" and the sarcastic hilarity at even taking up this topic. "Obama a Muslim? Tales from the Campaign Trail." DanielPipes.org, February 20, 2012. Follows the debate over Obama's religious affiliation during the 2012 presidential election seaon. "Obama's Muslim Childhood." The Washington Times, September 10-14, 2012. Extends, deepens, and supplants the above 2007-08 research on this topic.